The back 9 greens aeration was completed today. Holes poked, topdressed, sand blow and brushed into holes, greens brushed and rolled. The front 9 are healing well and should be in good shape by the end of this week. 18th green being aerated this afternoon. Tom blowing sand into holes on #17. Jason changing the holes and Jeff rolling the greens. I took a day off yesterday and watched most of the coverage and listened to local radio as well in anticipation of what was to come last night. I wanted to share this quote which was brought up in the coverage I listened to yesterday. Its from "Field of Dreams". 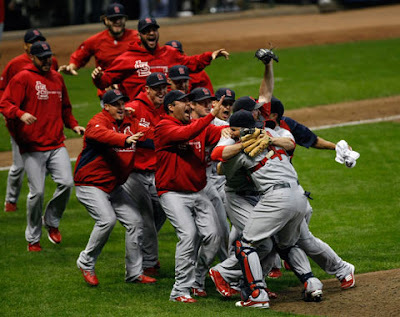 Its one of my favorites and also speaks to the heart of Cardinal fans and their love for this great game. Ray, people will come Ray. They'll come to Iowa for reasons they can't even fathom. They'll turn up your driveway not knowing for sure why they're doing it. They'll arrive at your door as innocent as children, longing for the past. Of course, we won't mind if you look around, you'll say. It's only $20 per person. They'll pass over the money without even thinking about it: for it is money they have and peace they lack. And they'll walk out to the bleachers; sit in shirtsleeves on a perfect afternoon. They'll find they have reserved seats somewhere along one of the baselines, where they sat when they were children and cheered their heroes. And they'll watch the game and it'll be as if they dipped themselves in magic waters. The memories will be so thick they'll have to brush them away from their faces. People will come Ray. The one constant through all the years, Ray, has been baseball. America has rolled by like an army of steamrollers. It has been erased like a blackboard, rebuilt and erased again. But baseball has marked the time. This field, this game: it's a part of our past, Ray. It reminds of us of all that once was good and it could be again. Oh... people will come Ray. People will most definitely come. The bridge on #10 that was pushed over by a big rain event in mid-summer was rebuilt this past week. 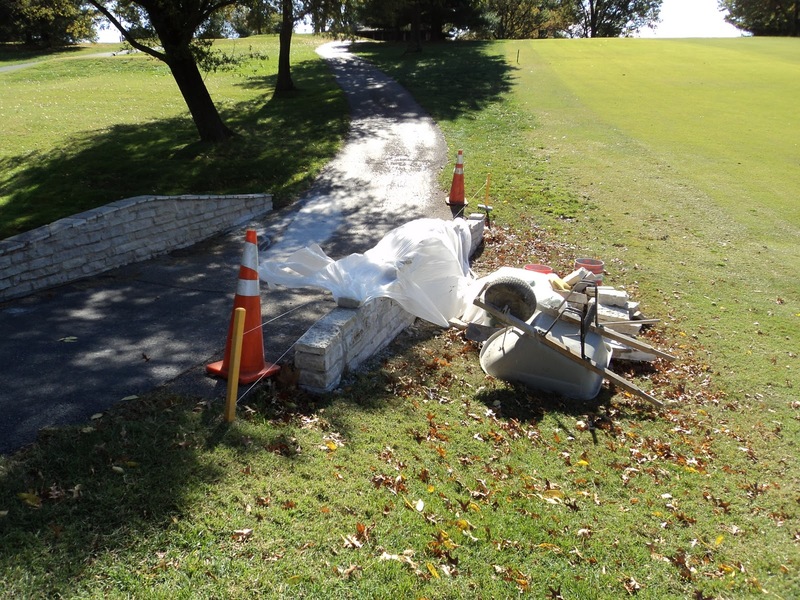 Our staff broke the bridge into individual pieces and chiseled the excess mortar off of each piece of stone in preparation for the stone company to restack and mortar it back into place. The bridge beginning to take shape. 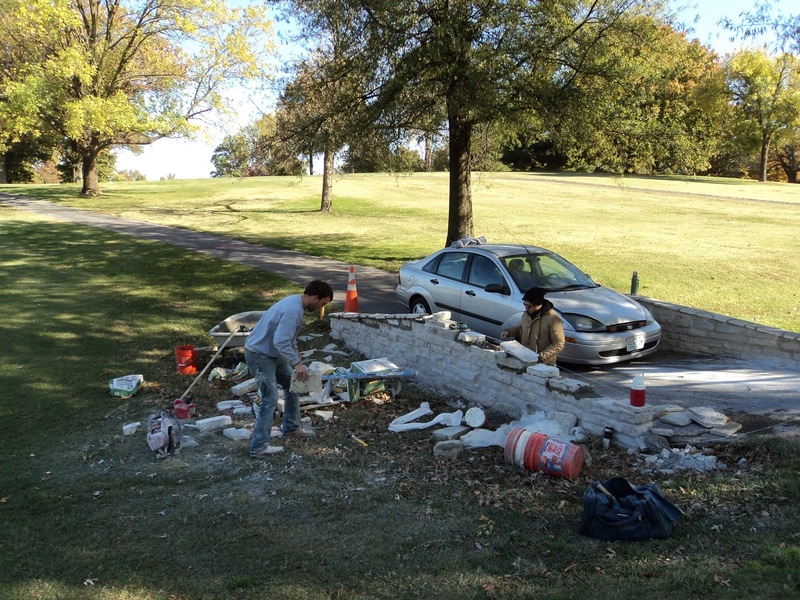 The staff from Stone Mill Design nearing the completion of the rebuilding of #10 bridge. The finished product as good as new. A solid 1/2" tine at a depth of about 8-8 1/2" in depth. We bury the greens with sand which is used to fill the holes. The sand is blown into the holes by our belly blower that is pulled behind a cart. The sand is then brushed to help smooth the surface and pull up any longer length grass blades. 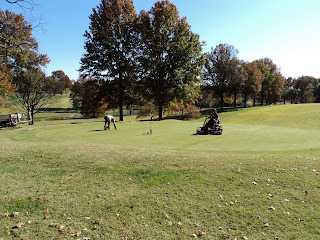 The greens are rolled to smooth the surface and then mowed. The mowing process is sometimes skipped if the sand is heavy. We finish the process with an application of fertilizer and throw on the irrigation heads to knock down both the fertilizer and sand. 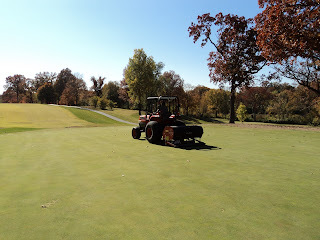 Below is a quick video of the aeration part of the process. Normally the unit is very smooth in its operation but with the added kick that we placed in the unit, it bounces around much more than normal. 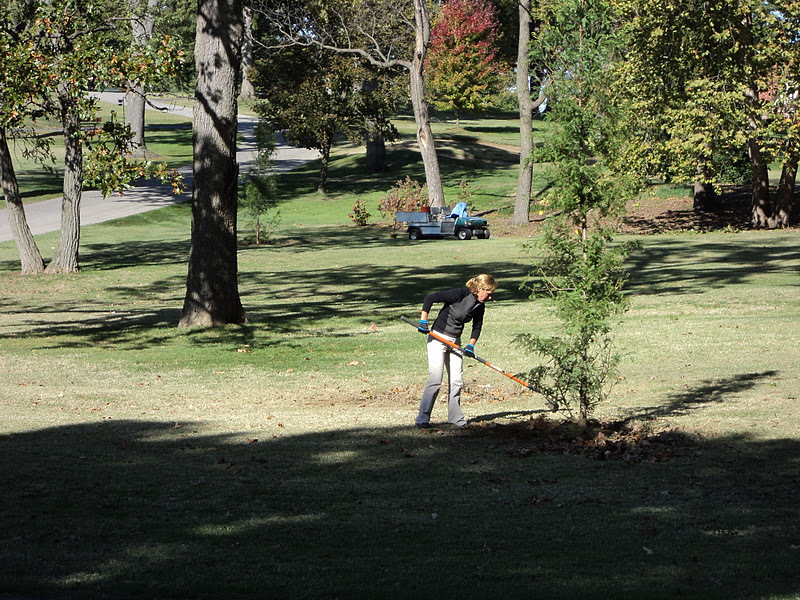 Our horticulturitst Becky Edwards through her affiliation with the St. Louis Horticultural Coop received a nice discount on three Dawn Redwoods that were planted late last week. The trees were cultivated from the Dawn Redwoods located in the back of Missouri Botanical Garden grounds and were named after past director Dr. Peter Raven. 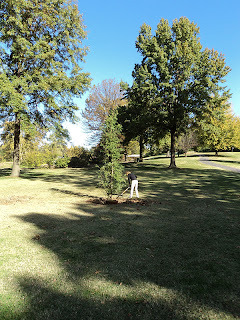 They were planted between the main road and #9 lake. 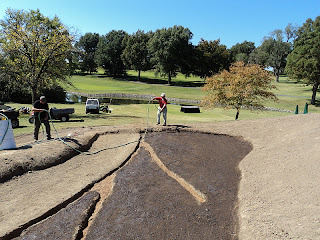 Skip pulling the bermuda sod and some soil away from the planting hole. Dumping the junk in the back of a cart to haul off. 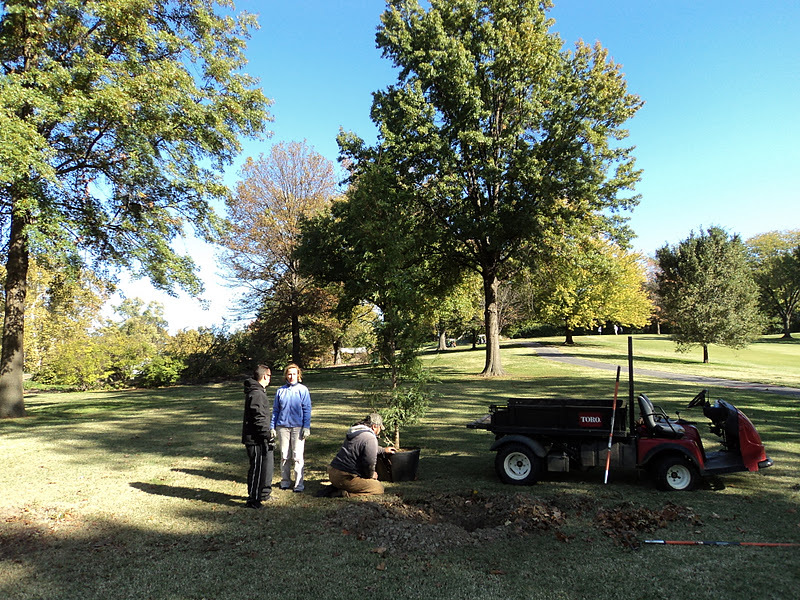 Skip and Tom getting the trees in the ground after Becky removed the soil from the holes. 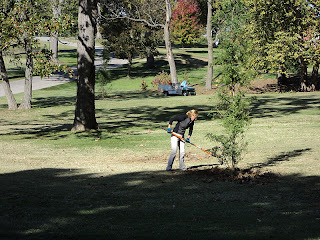 Becky finishing the backfill on the trees. Great game one. The boys played hard from the start. 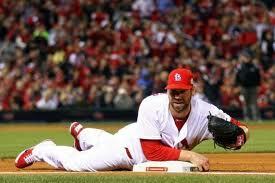 Can't help but be excited by the effort of Carpenter in the first inning with his play at first. Timely hitting, good plays and some great pitching again. Great to see the sun out today. Staff was pretty blurry eyed this morning but the cold weather woke us up. Weather improving over the next couple of days. Come out and see us over the next few days. Green speeds should be good with the drying wind. Greens Aeration will be taking place early next week. 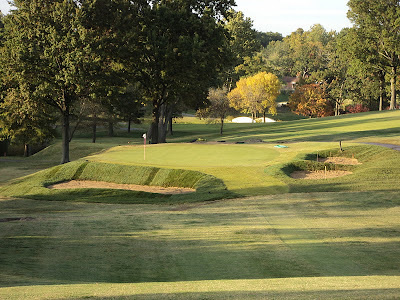 Article on the selection of the 2016 Olympic golf course design, first competition in golf since the 1904 Olympics at Glen Echo Country Club. I made an error in posting our fall deep tined aeration on the calendar for yesterday. We had a new event that was placed on the calendar during the season that was originally not posted at the beginning of the year. 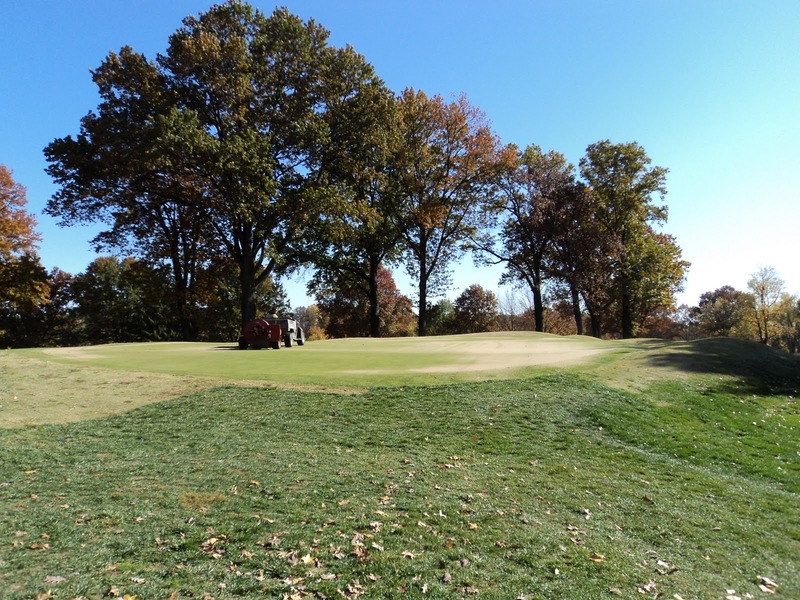 We will begin the process on October 31st and will complete a few of the remaining greens by Tuesday or Wednesday of that week without interfering with play. We will be using a solid tine which will penetrate 8-10" deep and will fill the holes. 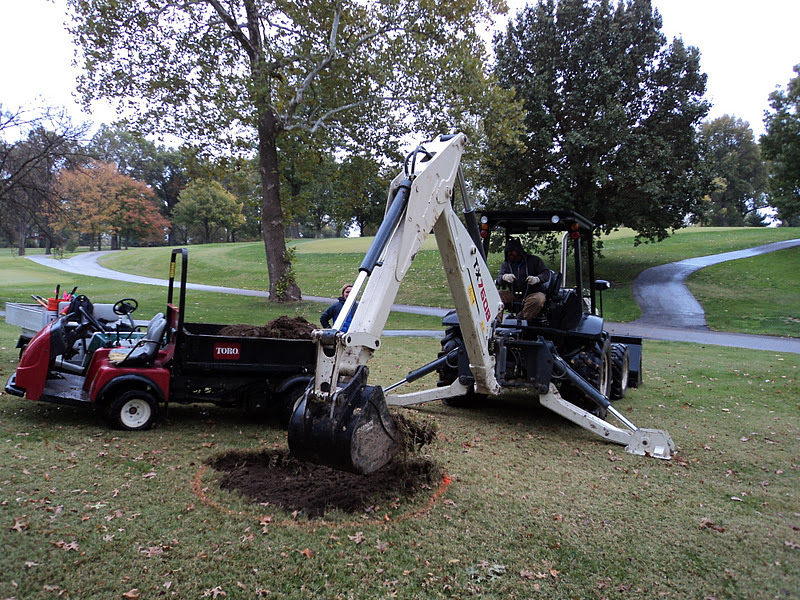 We will put a slight kick in the aeration arms which will help to fracture our soil base that our greens were built upon. The fracturing of this layer will allow for better water, oxygen and root penetration into this layer which is important for our greens since they have no subsurface drainage. We have some additional plugging that needs to take place before this aeration to help fill in some damage that is still evident from the summer. The extra sand applied to fill the holes and smooth the greens will help to fill in some of the smaller voids we still have from this summer's damage and will help support some of the new germinated plants that has been growing over the last couple of months. We still have weather in November for good growth which will allow our greens to continue recovering until the soil freezes. The greens should be very playable for our members who enjoy late fall and winter golf. 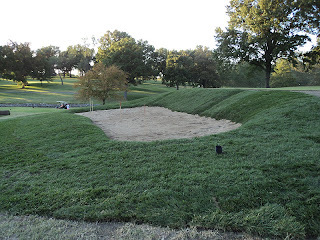 The zoysia short range tee has closed for the season. We close the tee this time of year because the zoysia is becoming dormant and will not grow enough to recover from divits. The mats will remain open throughout the winter as weather permits. 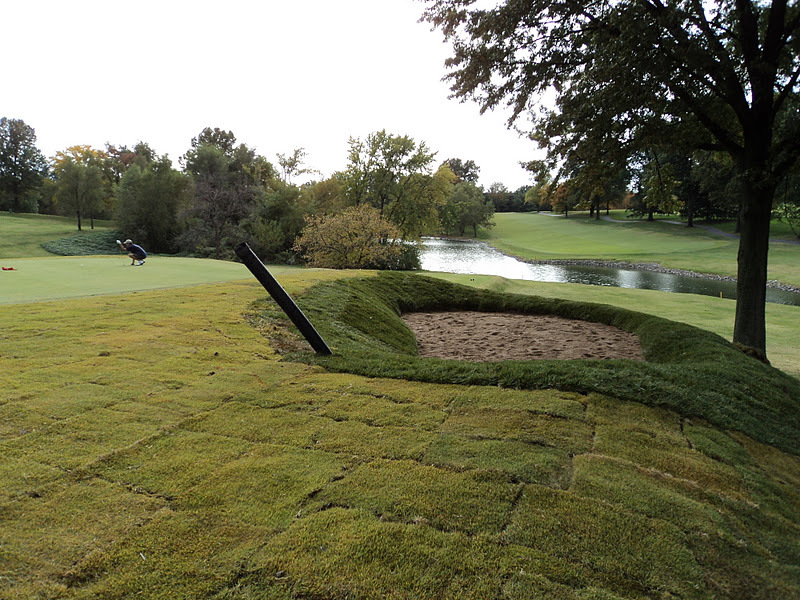 The long range grass tee will be open for a couple of more weeks(weather permitting) until around November 1st. The mats of the long range will be open after the first of November only on the weekends due to the metro link construction project that is taking place along the driving range ditch. The contractor is also using the back corner of the range as a staging area which prevents the range from being open during this project. 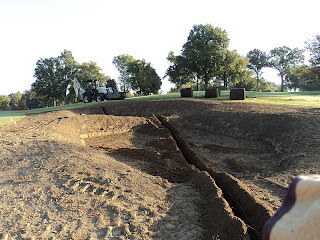 #14 new bunkers are draining! The new bunkers on #14 are handling the 1.35" of rain very efficiently. 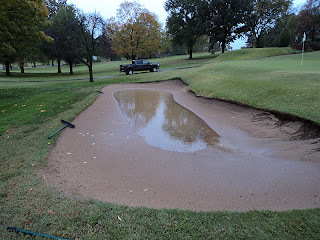 No water in these bunkers compared to all others that are filling up with water as I type. No water in the newly built bunkers(What a beautiful site) but plenty of water sheeting across the green this morning. #6 bunker, not full to the top but will still need to be pumped and will take at least 2-3 days to be in reasonable shape for play. Some interesting weather stats for September. If you take away the first 3 days of 100 degree temperatures, the average temperature for the month would have been well over 5 degrees below normal. 15 days over 100 this year is the most since 1980 when we had 18 days. 2006 and 2007 had 6 days over 100 which are the next closest number of days since 2000. 63 days over 90 is 3 less than 2010's 66 days. We had the 33rd wettest June/Aug period. Wet conditions in the spring and early summer lead to some potentially weakened green root systems. Water replaces oxygen in the soil which reduces the overall health of the plant A very hot early June with wet root systems and soil temperatures beginning to elevate quicker than normal begins to slow the growth of the roots. Storage reserves are reduced in the plants because of higher than normal soil temperatures which signals the roots to begin to utilize energy and not grow any further. A reduction in storage reserves leads to energy depletion during the worst heat and stress of the summer. All-time record highs for the summer add more punishment to an all ready weakened green system which in turn leads to some of the damage that we experienced this summer. Lack of air movement(fans), no green drainage systems, spring preparations hurt by heavy rainfall and placing the most important tournament of the season in the middle of the most stressful time of the year all contribute to some of the damage that we experienced this season. No doubt that water management always plays a role in some turf loss. Not enough at the proper time or sometimes too much at other times. Once a area begins to dry down, it can take up to two days to get adequate moisture back in an area to calm it down or reduce the damage. 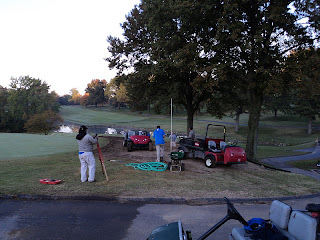 PRECIPITATION 3.18" 3.13" 0.05" 3.7"
Interesting study completed regarding the Missouri Golf Industry. JEFFERSON CITY | A new study concludes that golf is an $889 million industry in Missouri. The study released Tuesday says most of that money comes from Missouri's 352 golf courses, 40 driving ranges and 30 miniature golf courses. But the figure also includes revenues from such things as real estate deals, tourism and golf supply sales. It says the direct economic impact of golf in Missouri is comparable to that of the manufacturing of engines, turbines and transmission equipment. 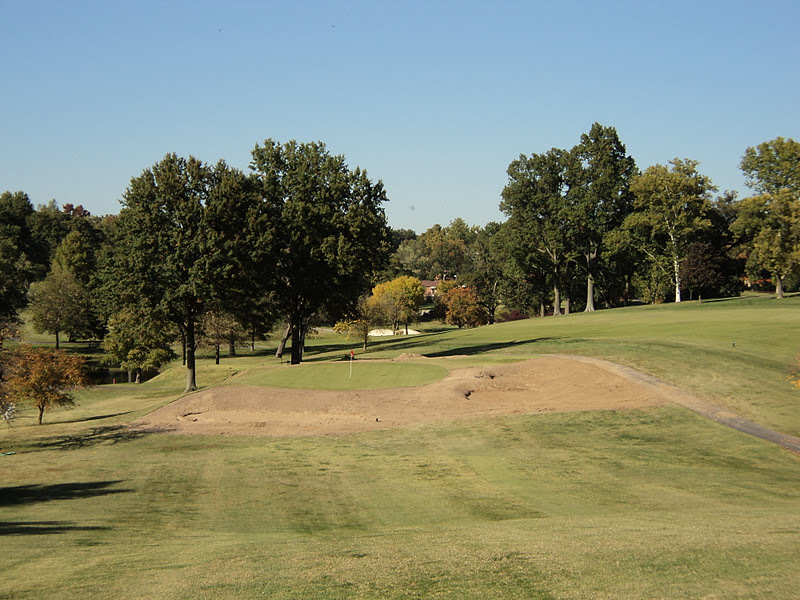 When indirect spending is included, the study estimates golf has a total economic effect of $1.7 billion in Missouri. 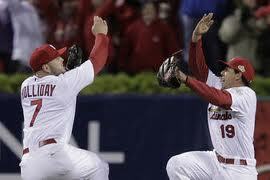 A blurry eyed Monday but a happy day for all Redbird lovers. Improbable run still going. 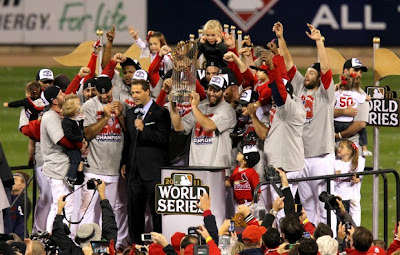 Great to see a group come together like they have over the last 40 games or so. 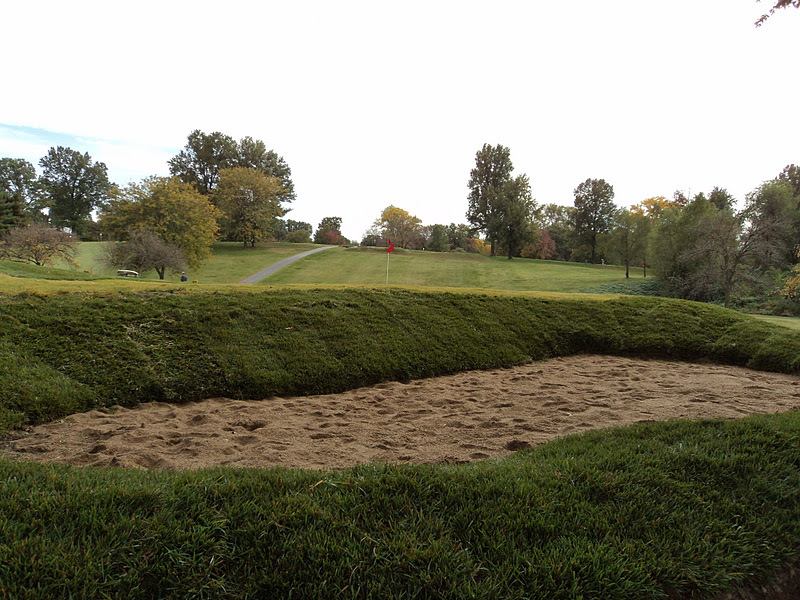 Push mowed the new bunker fescue on Friday. Some rain early this week so we will see how things firm up after the rains. Some great weather for golf the last couple of weeks but as the calender moves forward, so does the process within our 1000 trees on property to begin the yearly dropping of their leaves and needles. The early round of trees include the Ash, Walnut, Locust, Cottonwood, London Plane Tree and White Pines which are shedding their second year needles. We have two blowers, two rough units with mulching decks and our green surround unit which has mulching decks as well. We utilize our leaf vacuum for the later round of leaves near the end of the month when the piles become too big to run our rough unit over the top. Leaf clean up will probably take place everyday over the next month. We will utilize our cart with pull behind belly blower to keep greens cleaned during windy days when backpacks just cannot keep up with the leaves raining down. On the weekends, we clean the leaves off of the greens first thing in the morning ahead of the mower and will come back after lunch and do another round of cleaning for weekend afternoon play. During the week, we will use our large area blower to remove leaves from the fairways and will create win-rows in the rough so our rough units can grind the leaves into smaller pieces allowing them to break down more quickly. We will blow off the fairways on the weekends but are limited in the time we can spend on the course so we do not disrupt our morning weekend players. 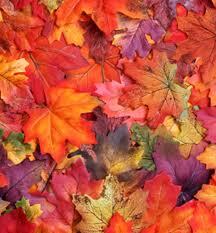 We appreciate your understanding as we try to chase down the leaves from our trees. 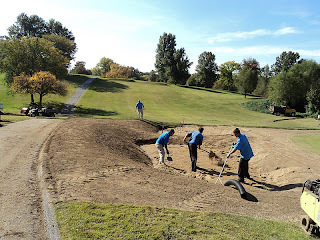 Day 5, Bunker Restoration Project Complete! 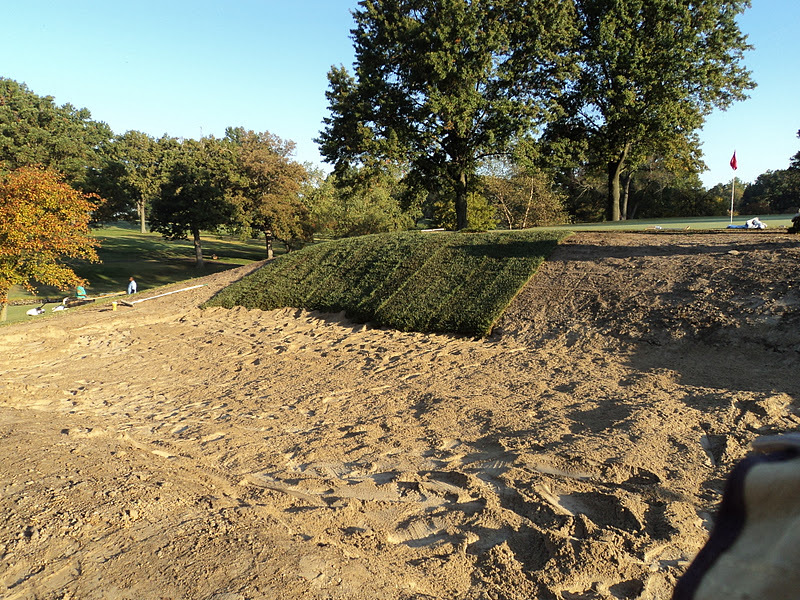 Day 5 and the back bunker was completed today(Monday). Drains installed, gravel covered, liner sprayed, sand added and the surround sodded. 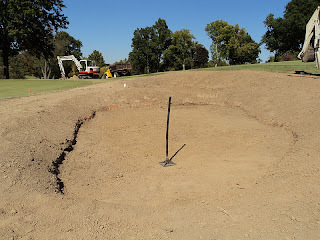 The three exit drain lines need some general clean up, sand compacted, and sod hand watered to insure proper rooting/growth over the next couple of weeks. 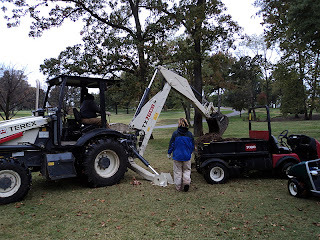 As the sod begins to grow and is rooted, we will begin to push mow the sod. It is very important that members retrieve their golf balls from the newly constructed area and play from outside the area. We left ropes off of the area to allow easy access. Please respect the efforts of our maintenance staff and do not play in the newly constructed area. 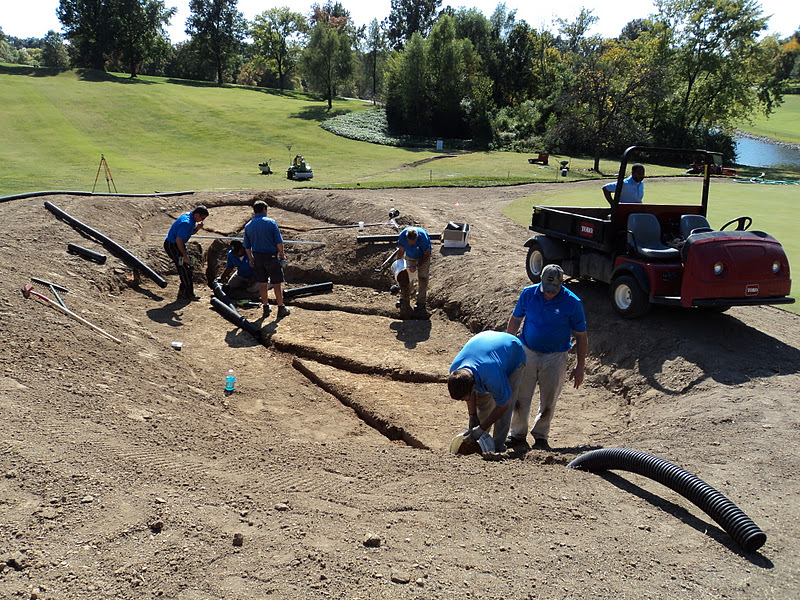 The staff working in the rear bunker, checking drainage grades. Skip preparing to check the grades. The finished product from the lake side of the green toward 10 fairway. From the 10 side looking toward the lake. From the back of the rear bunker looking forward. The wind blew and the leaves fell. The temperature is perfect and the greens are rolling out. 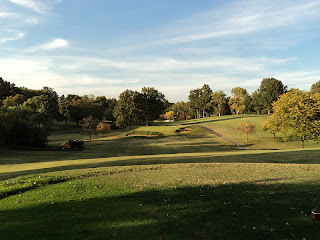 We spent most of Friday trying to get the course ready for the weekend. We made a turf adjustment and replaced the zoysia approach that we laid yesterday with fescue which gives a more consistent look across the green complex. 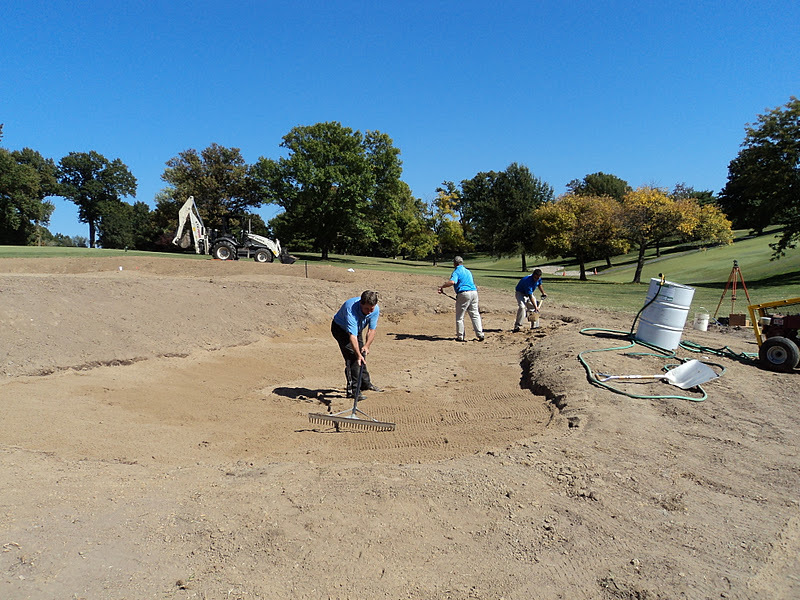 We will spend Monday getting the rear bunker completed. Overall, I think the process went well. I hope you like the changes to the hole. I know my staff will enjoy maintaining these new bunker complexes. 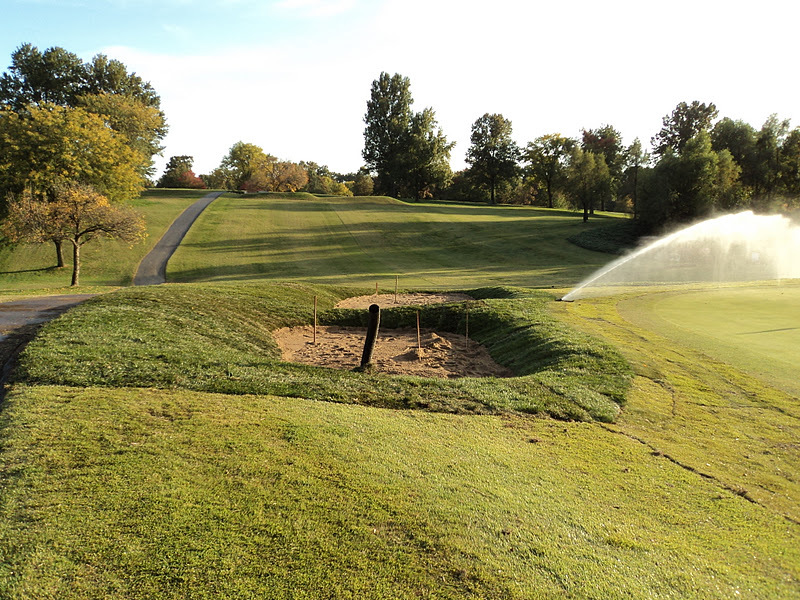 Below is a comparison of the old hole and the restored/renovated hole. Today's view with the new fescue sod in the walk up/approach area instead of zoysia. The 2009 view of the old hole. A close up of the new bunker work. Well, four days are in the books for our bunker project. 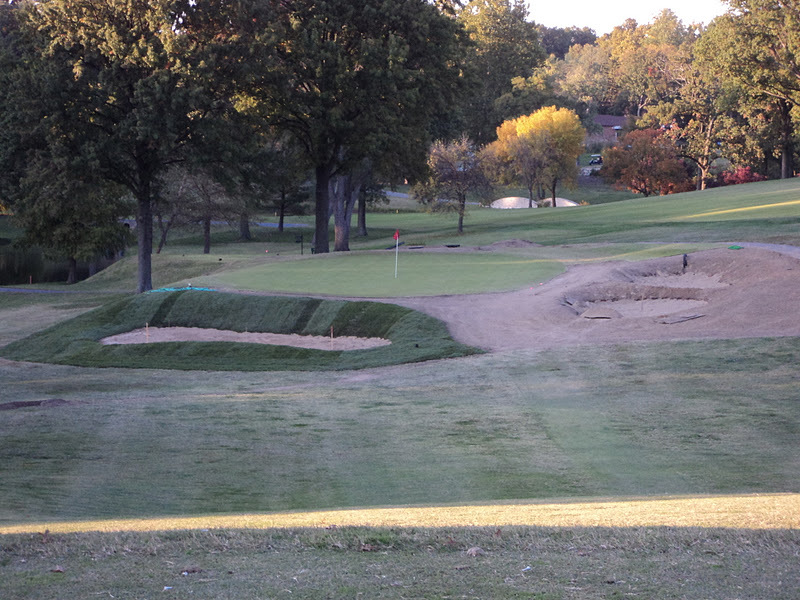 The two right side bunkers were completed today. We had to spread sand and laid about 200 yards of fescue and 100 yards of zoysia. 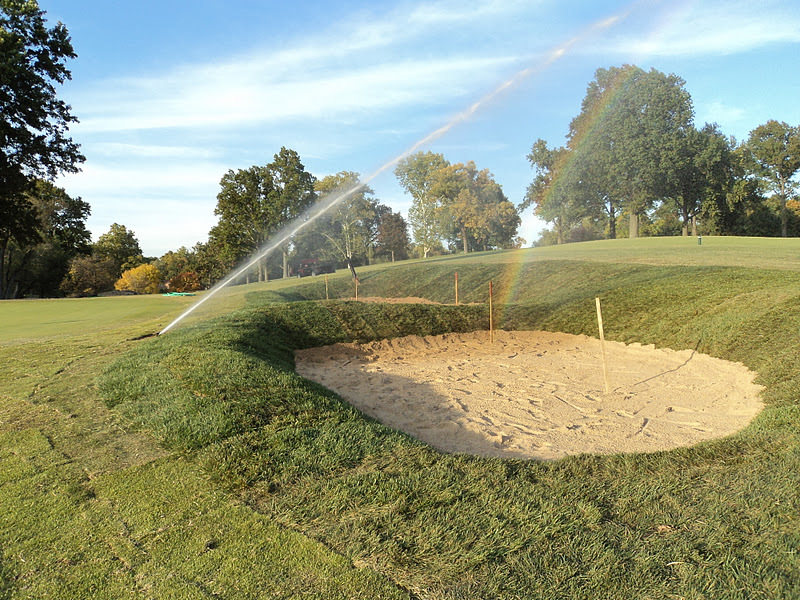 We will begin to increase our watering of the area since the temperatures and winds are beginning to increase. Expect over the next 5-10 days that the area around the bunkers will be soft. Please enter and exit at the lowest points to retrieve golf balls. 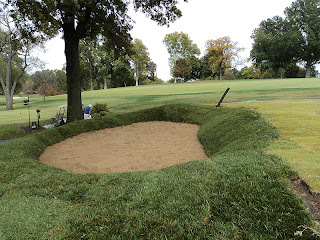 We have to do some major course work tomorrow to get the place cut and trimmed for the weekend but I expect to get some work completed on the back bunker tomorrow afternoon. Drainage and liner installation and hopefully sand placed in the bunker tomorrow. Sodding of the bunker will probably take place on Saturday. All the staff have been working tirelessly on this project. Morning duties for 2-3 hours and then over to the bunker project. 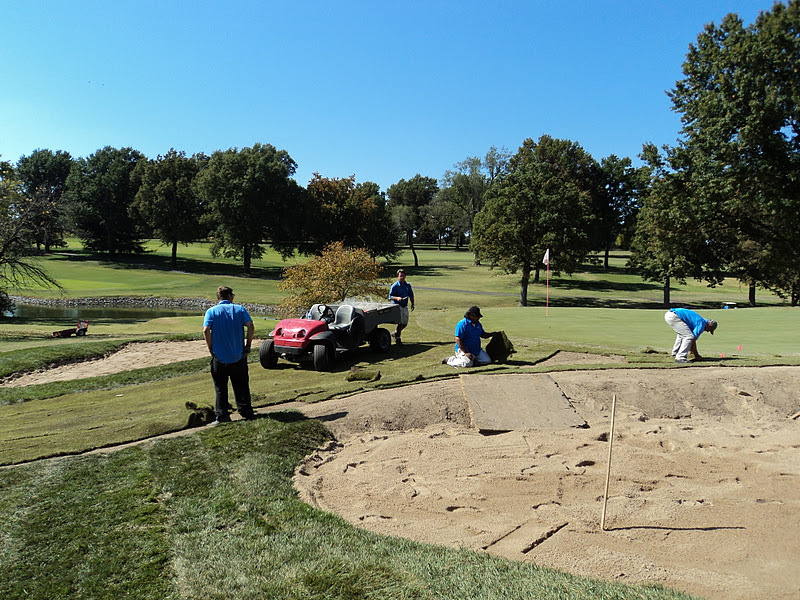 Jeff, Russ and Tom spreading sand in the right rear bunker. 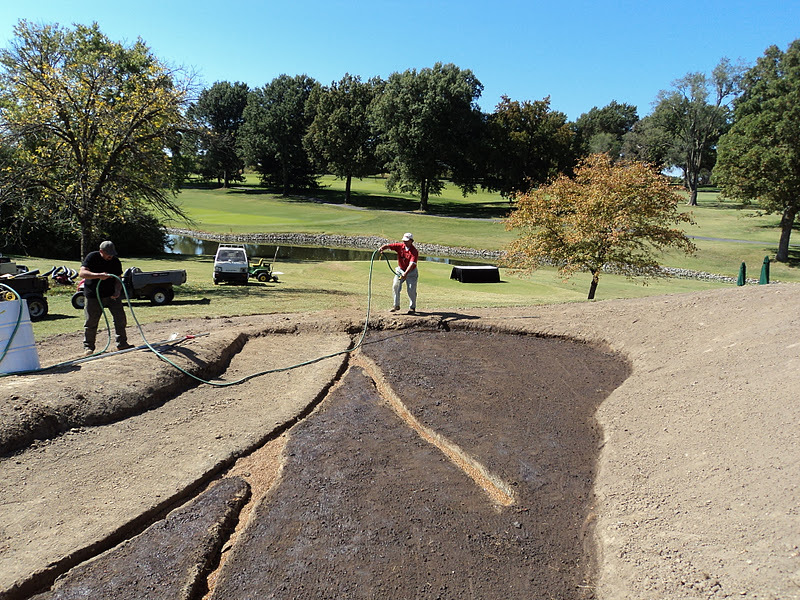 Jason working with Skip in laying the fescue around the bunkers. 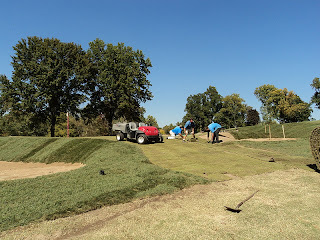 Staff laying the zoysia in the approach and intermediate cut around the green. 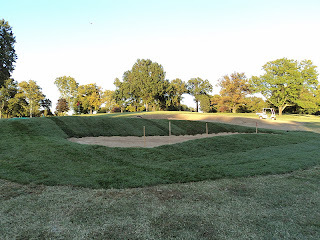 Fescue sod half completed around the right bunkers. You will notice that the sod is up over the bottom of the turf. That is being done to protect the intergrity of the bunker edge and reduce some of the soil that might enter the sand before the sod has a chance to become fully rooted. We will go in next spring and reform the edge exposing about 1-2" of edge above the sand. Water flying, 2 right bunkers completed. We water mostly with a hose to insure that all areas get adequate moisture and we can hit some of the more stressed looking sod with more water as needed. 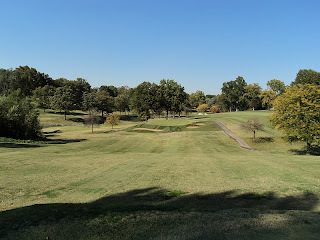 From the back right corner of the green complex looking back toward the tee. A close up view, IT'S AWESOME! 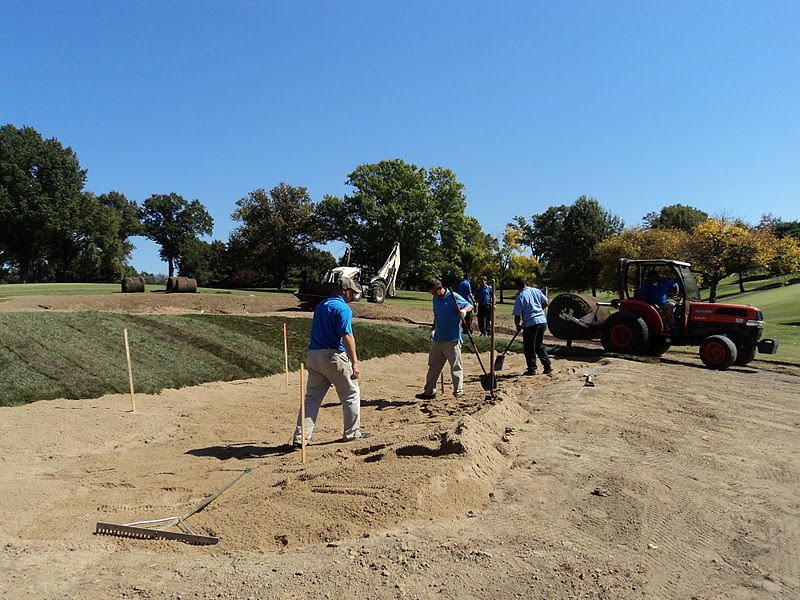 Well, day 3 is complete and so is the first bunker. The two bunkers on the right will be filled with sand and sod will be laid on Thursday. 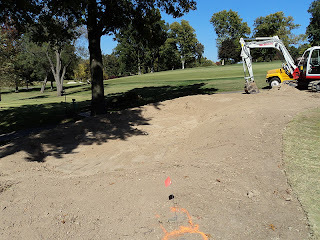 We have decided to continue with the intermediate cut(1.25") between the left bunker and the two right bunkers that tie into the walk path from the tees. 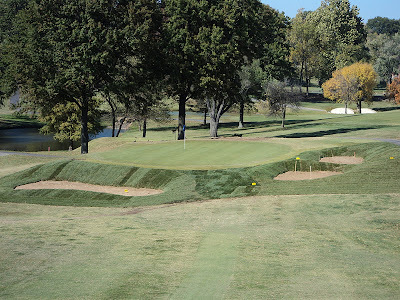 One pass of intermediate will go around the left and right side of the green and the bank behind the right side bunkers will stay at the shorter height just like we have been doing this season. The remaining area around the bunkers and next to the cart path will be fescue mowed at 2.25 inches. Just a reminder, the complete construction area will be ground under repair for a couple of weeks to allow the sod to take root and the sand to settle. You will be able to enter the areas to retrieve your golf ball but we ask that you go to an established turf area for your next shot. This includes the bunkers as well to prevent bunker shots from hanging up in the new turf in case you do not reach the green surface. The new sodded areas will have to be kept moist to assist with the growing process and should not be walked on except to retrieve a golf ball. Skip leading the staff in laying big roll fescue down the face of the left bunker. 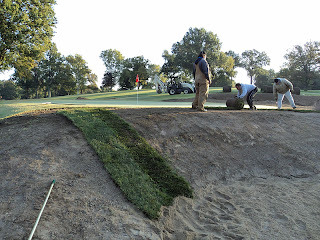 Keeping the sod in longer pieces will reduce the chance of washing and movement in case players have to walk on the new area to retrieve their golf ball. A few more pieces of sod added to the left bunker bank. 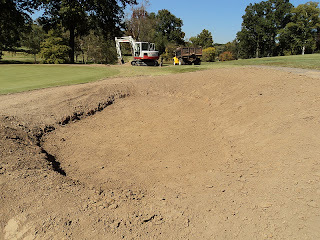 Bunker face completed and additional rolls being placed around the bunker. Also, staff shoveling sand into the different areas of the bunkers. The stakes are in place to assist with the proper depth of the sand. We are placing 6" of sand which will be compacted to about 5" with water and a vibratory plate. 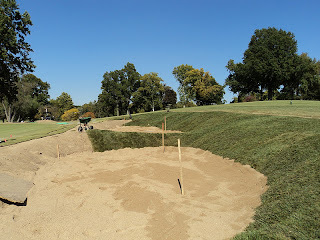 The completed front left bunker. Its a beauty! Another view of the front left bunker. The pipe in the foreground is a clean out pipe in case some type of blockage would occur that we could attempt to aleviate with a blast of water but we do not expect this to occur. It will be capped and covered. Trenching of the right front bunker. 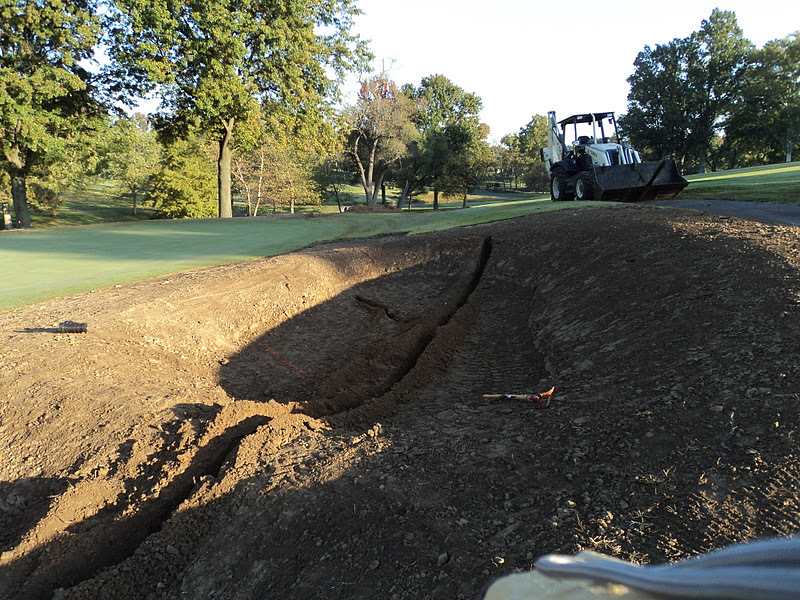 Trenching of the right side rear bunker. Drainage being installed in the trenches. Pea gravel of a couple of inches is placed in the trench first, the pipe is then snapped together, a screw is drilled through each coupler to insure that it stays together and duct tape is wrapped around the joint.. Sand placed in the front right bunker before we left for the night. Sand in the rear bunker. The complex at the end of the 3rd day. Its shaping up very nicely! Another day complete in our bunker project work. Kye Goalby finished his work on the back bunker by around noon today. The staff picked up the soil from the trenching on the left bunker, placed the pea gravel and drainage pipe in the bunker, sprayed the polyurethane bunker liner on the floor of the bunker and filled the bunker with over half of the sand that was needed. No sodding today but plan to lay most of the sod around the left bunker tomorrow morning. 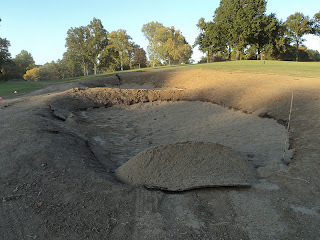 The other 3 bunkers will be trenched tomorrow and spoils removed. I hope that we can begin to place sand in the two right bunkers tomorrow. We will be pushing to be fully complete by Thursday but will be close. With sodding needing to get on the ground, there will be a big push over the next day. Yours truly with assistance from mechanic Harry spraying the liner material on the bottom of the bunker to reduce soil contamination. Russ, Jason and Tom spreading sand in the left bunker. 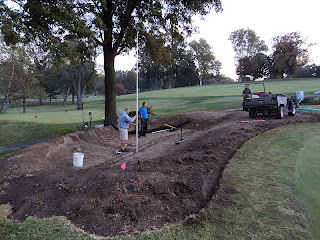 The front right bunker ready for trenching. 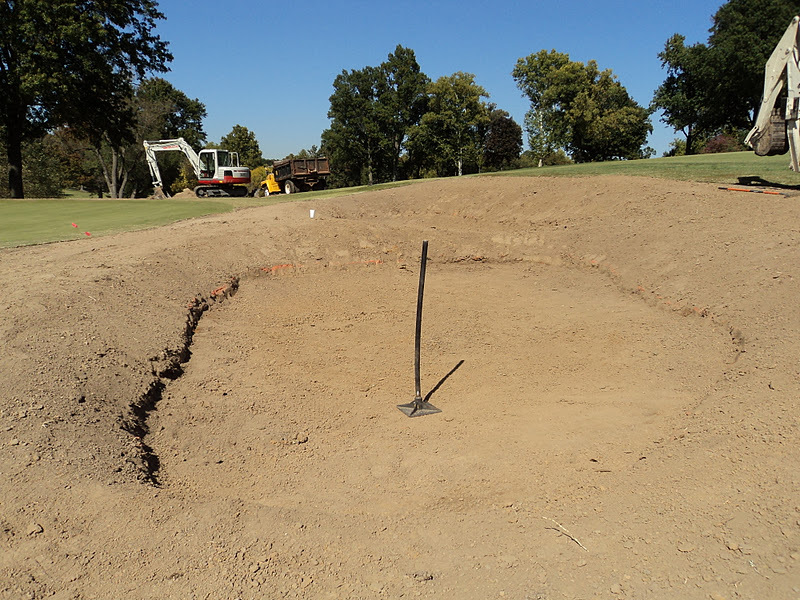 The rear bunker prepared for trenching. 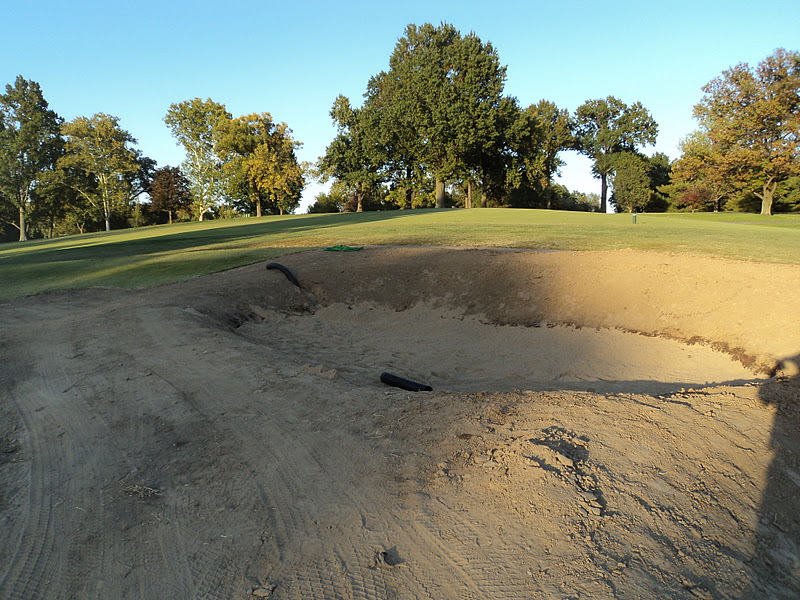 The back bunker still needs some edging and dirt work around the bunker and inside. Day two complete. Will look a lot different with sod laid tomorrow!